Машината не е подходяща за работа с картридж система! No more endless twisting and turning of your hit adjuster to find your favourite setting. 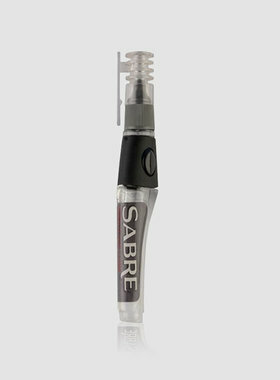 The “One Touch” Sabre adjuster features 10 settings. You can go from ultra hard to soft in one single turn. As its indexed your favourite set up can be returned to each time, taking the guesswork out of your work. Constructed from scratch resistant BioCote® ABS and black anodised aircraft aluminium. From the initial concept design to the injection moulding and CNC aluminium work is all manufactured right here in the UK, except of course the Maxon Swiss motor.